Retro becomes modern in an exciting twist on the 8-bit era! Boss Monster is a game for ages 13 and up and is perfect for anyone who ever sympathized with any of the big baddies on the Nintendo Entertainment System. It takes about half an hour and is for 2 to 4 players. Players are randomly dealt one of the game’s Boss Monster cards, which are all clear parodies of classic video-game bosses such as Bowser and Ganon. The players act as these bosses, looking to build a new dungeon—presumably because they want to make a name for themselves or hoard their treasure somewhere safe. By adding rooms to your dungeon, up to a maximum of five outside the boss room, you also add various treasure values to your dungeon, which attracts heroes from the town space. Each room deals damage to anyone who passes through, but if the hero makes it to the boss room, they wound your boss, so watch out! If a player receives five wounds, they die. However, if you have prepared your dungeon well, your dungeon will kill the hero, and then you collect their soul as a prize! If you reach 10 souls, you win the game. Those are the basics, but there is more to it than that, such room upgrades, spells that mess up other bosses, and the existence of Epic Heroes, which deal double the damage and are worth double the souls. The flavor to this game is amazing. Anyone who has had the pleasure of playing any of the original games from Nintendo’s early years, or who even knows a bit about them, will find a lot of similarities in the heroes and villains of this game. There are even nods to other geek favorites like Magic: The Gathering and Game of Thrones. It can be quite the honor when the hero modeled after George R. R. Martin, Ser Mortin the Deadly, manages to kill you off and add you to the list of others who have died too early by his hand. The theme to this game is so rich it is almost palpable, but the gameplay adds its own unique flavor as well. It isn’t so much competitive in a head-on manner—it’s more of a race variant. The mad dash to complete your dungeon is rewarded by activating your boss’s one-time special ability, which usually gives your lead an even sharper edge. And rather than attacking your opponents, it would be more accurate to say that you trip them during your foot race. By casting a quick spell that removes the damage from even one room, for example, you can change a player’s fate from victory to game over. 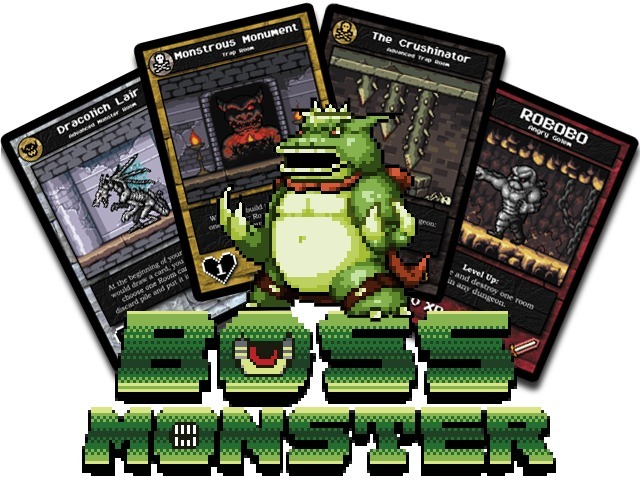 Boss Monster is a wonderful, light game that I feel even the most casual gamers can enjoy. It retails for $24.95, and a quick online search turns up places selling it for two-thirds of that, making the commitment risk of this game a light one as well. It makes a great addition to anyone’s collection but will especially appeal to those who can relive their past by enjoying its parody of their golden-oldies games.